Jennifer is the Associate Collection Manager for the Division of Entomology. Her primary tasks include collection recuration, digitization, preservation, specimen preparation, as well as management of loans and accessions for the collection. She also maintains and develops the collection database in Specify. 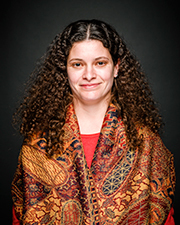 She oversees day-to-day division operations, trains and supervises undergraduate and graduate students working in the collection, assists visiting researchers, and participates in public programs with the Department of Public Education of the Natural History Museum. Rasmussen, C., J.C. Thomas, & M.S. Engel. 2017. A new genus of Eastern Hemisphere stingless bees (Hymenoptera: Apidae), with a key to the supraspecific groups of Indomalayan and Australasian Meliponini. American Museum Novitates 3888: 1–33. Engel, M.S., J.C. Thomas, & A.S. Alqarni. 2017. A new genus of protorhyssaline wasps in Raritan amber (Hymenoptera, Braconidae). ZooKeys 711: 103–111. Michael S Engel, Diying Huang, Jennifer C Thomas, Chenyang Cai. 2017. A new genus and species of pygidicranid earwigs from the Upper Cretaceous of southern Asia (Dermaptera: Pygidicranidae). Cretaceous Research 69: 178-183. Rust, J., Singh, H., Rana, R. S., McCann, T., Singh, L., Anderson, K., Sarkar, N., Nascimbene, P., Stebner, F., Thomas, J.C., Solórzano-Kraemer, M., Williams, C.J., Engel, M.S., Sahni, A., Grimaldi, D. 2010. Biogeographic and evolutionary implications of a diverse paleobiota in amber from the early Eocene of India. Proceeding of the National Academy of Sciences, USA 107(43): 18360–18365. Thomas, J.C. 2009. A preliminary molecular investigation of aleocharine phylogeny (Coleoptera: Staphylinidae). Annals of the Entomological Society of America 102(2): 189–195. Williams, P.H., & J.C. Thomas. 2005. A bumblebee new to the New World: Bombus distinguendus (Hymenoptera: Apidae). The Canadian Entomologist 137(2): 158–162. SEMC is back on the World Wide Web – An Introduction to the new Specify 6 Web Portal, November 9th, 2013, Entomological Collections Network, Austin, Texas. Pre-digitization Curation, April 25, 2013, Workshop for Digitizing Dried Insect Collections, The Field Museum, Chicago, Illinois. Entomology specimens develop dissociative identity disorder, November 10, 2012, Entomological Collections Network, Knoxville, Tennessee. Specify 6 for Entomology Collections, November 12, 2011, Entomological Collections Network, Reno, Nevada. OCEANIA: Aleutian Islands (Adak Is., Rat Is., Attu Is. ), 2002–2003.